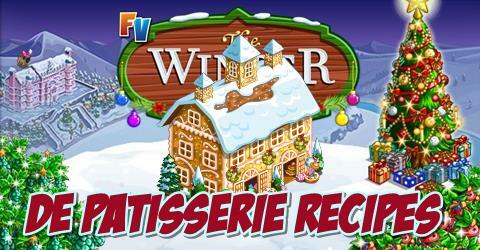 FarmVille De Patisserie is one of the major crafting building that you will find in FarmVille Winter Noel farm. You can craft up to 20 plus new recipes at the De Patisserie. This guide will show you the various recipes that you can craft. At the beginning, you will start at level 1 star and will only craft recipes that are on level 1. You’ll then gain experience everytime you craft at the De Patisserie. Candy Cane Meringues = Fall Roses Bushel x3, Lake Flake Melon Bushel x3 and Winter Green Flower Bushel x2. Eggnog Tarts = Mistletoe Orange Bushel x2, Aurora Ball Flower Bushel x2 and Winter Green Flower Bushel x3. Peppermint Patties = Fall Roses Bushel x2, Winter Green Flower Bushel x3 and Mistletoe Orange Bushel x2. Vegetable Platter = Mistletoe Orange Bushel x3, Lantern Melon Bushel x3 and Ribbon Peaches Bushel x3. Marshmallow Pops = Alpine Candy Mushroom Bushel x3, Lantern Melon Bushel x3 and Mushroom Bonsai Bushel x3. Raspberry Cider = Snowy Squash Bushel x2, Swirl Sunflower Bushel x2 and Autumn Multiflower Bushel x2. Filling Tree Cookie = Mushroom Bonsai Bushel x3, Holiday Dragon Fruit Bushel x3 and Jewelled Autumn Mango Bushel x3. Cranberry Pie = Fall Cabbage Bushel x3, Alpine Candy Mushroom Bushel x3 and Ribbon Blossom Beets Bushel x2. Gingerbread Pancakes = Wool Stripe Aloe Bushel x3, Button Flower Bushel x3 and Chocolate Chip Wheat Bushel x3. Dark Cane Cookies = Holiday Dragon Fruit Bushel x3, Peppermint Barley Bushel x3 and Fall Hyacinth Bushel x3. Reindeer Rice Krispies = Fall Cabbage Bushel x3, Button Flower Bushel x3 and Alpine Candy Mushroom Bushel x3. Peppermint Mocha = Wool Stripe Aloe Bushel x3, Peppermint Barley Bushel x3 and Lantern Melon Bushel x3. Reindeer Popcorn = Button Flower Bushel x3, Snowy Squash Bushel x3 and Alpine Candy Mushroom Bushel x3. Pecan Pie Bars = Fall Hyacinth Bushel x3, Holiday Dragon Fruit Bushel x3 and Woolen Water Blossom Bushel x3. Grinch Hot Chocolate = Lantern Melon Bushel x3, Chocolate Chip Wheat Bushel x3 and Tangerine Candy Flower Bushel x3. Snowmen Fudge = Ribbon Blossom Beets Bushel x3, Tangerine Candy Flower Bushel x3 and Winter Red Pumpkin Bushel x3. Christmas Swirl Cupcake = Swirl Sunflower Bushel x3, Holiday Dragon Fruit Bushel x3 and Candy Capsicum Bushel x3. Homemade Gumdrops = Ribbon Peaches Bushel x2, Button Flower Bushel x3 and Peppermint Barley Bushel x3. Holiday Trifle = Plaid Sprout Bushel x3, Jewelled Autumn Mango Bushel x3 and Mushroom Bonsai Bushel x3. Mint Chip Cookies = Fall Hyacinth Bushel x2, Button Lilly Bushel x2 and Swirl Sunflower Bushel x3.